As we enter the final month of 2018, it is a good time to take a peek back at this very unique year. It’s hard to remember a year that started out of the gate so strong only to see a correction of 10% from record highs within weeks. Then, shortly after rebounding all the way back to new all-time highs again, the S&P 500 dropped another 10%. Bespoke Investment Group tells us that in the S&P 500’s history dating back to 1928, there have only been four other periods where the S&P 500 had two 10%+ corrections from an all-time high within a 12-month stretch. Of those four prior periods, there was only one where the two 10%+ corrections occurred in the same calendar year. That was in 1990. While 1990 saw the S&P decline by 3% and close the year at 334, there wasn’t another down year until 2000. In the interim, the S&P rallied and closed 1999 at 1,248, some 373% higher. Now I’m not suggesting that will happen this time around. I simply posted that today as a gentle reminder to the Bears that are nipping at the heels of the Bulls, nothing is certain. I have always stressed the importance of having a strategy, a process, and of course sticking to it. Completing the first part is much easier than the second. The up and down emotional market swings this year have posed unique challenges to investors. Buy these corrective dips, sell these new highs?, or watch and wait. Investment plans were surely tested. It is one thing when personal situations arise that may change your investment ideas. That is understandable, and when those issues arise, priorities can and will change. In the last few years, however, many seasoned investors have altered their plans for no other reason than being caught up in the worries. This year leads the pack in that regard. A run to new highs early in the year met with the first mention of trade issues. A correction that was said to be the start of the next bear market. A run back to new highs and then it’s time to complain that the Fed is on a mission to bring the economy to recession and more trade talk added to that conclusion. The complaining continues now with the chant that nothing seems to be working. Well, I am not so sure about that. Perhaps for those that make calls for S&P 3,000, then change to S&P 2,200, and now reverse course again, nothing is working. If they actually followed that whipsaw strategy for the first eleven months of the year, it is easy to see their frustration. On the other hand, anyone that has been patient, watched the price action, never getting too high or low with their emotions has survived the extremes. There is no shortage of strategies and/or indicators to follow. Successful investors should lean to one that will not have leave them prey to emotional swings on every 5-10% move in the indices. It also means they should employ the traits every successful investor possesses. Flexibility in an approach, be open minded and confident. When I see a plan change because of ONE issue or because ONE indicator has changed, it tells me blinders are in place. The investment community has this penchant for taking the easy way out. That leads to mistakes. Of course, then it becomes routine to blame the issues for their mistakes. That would not happen if their plan was grounded instead of being influenced by every headline and every indicator. My approach is centered around consistency. Eliminating the tendency to make major changes in investment strategy until the primary trend in place is indeed changing. It avoids extrapolating any issue to an extreme positive or an extreme negative, and there is never any guessing that a trend is about to change. It’s not infallible, but in my view, it beats what many other profess as the “only way to proceed”. In the last 5 years or so, we have seen many of those pundits disappear. The stock market has a way of neutralizing those that like to flow with the wind. Scott Grannis shares his wisdom in his recent article discussing the yield curve and the thought of an impending recession. For years market participant have been hearing about the onset of the next recession. Suffice to say that we will continue to hear warning after warning now about the state of the economy. In addition to all of the signals that investors have and will continue to hear about the onset of the next recession, we all need to realize that recessions are born to take out the excess that have built up during the expansion that preceded them. Therein lies the issue that the naysayers will have to deal with. There are none. I am of course referring to excesses. Well, none that would suggest a bubble like backdrop, or a feeling that “all is so good what could possibly go wrong” mentality. In fact it is just the opposite, it’s more like what could possibly go right? No reason at all to jump to any conclusion now. After all the yield curve hasn’t even inverted yet, and I’m not one to listen to the “its inevitable” talk. Sure there could be an imminent inversion, but there are many times in history where the curve stayed flat for months on end. While market participants should not put their heads in the sand, it may be worthwhile to wait until it actually happens before any significant changes to an investment strategy are pursued. U.S. Markit manufacturing index fell 0.4 points to 55.3 in November for the final reading (55.4 preliminary), after inching up 0.1 point to 55.7 in October. The index has faded from its cyclical high of 56.5 in April, but remains at a robust level. 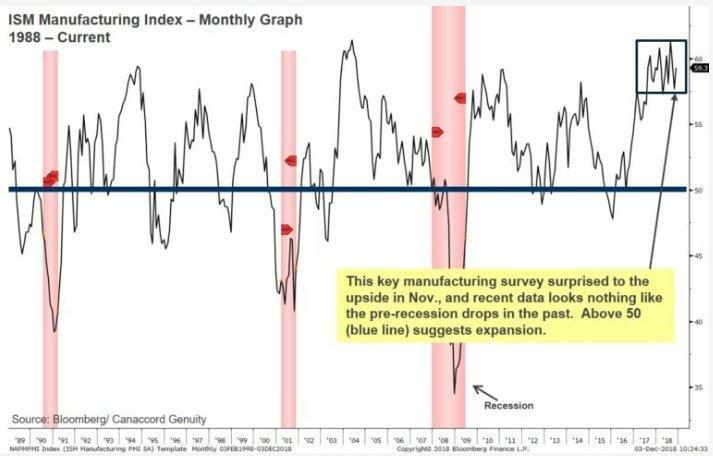 The bounce for ISM Manufacturing to 59.3 in November reversed the October drop to 57.7 from a slightly higher 59.8 in September and a 14-year high of 61.4 in August. Analysts saw a prior 14-year high of 60.8 in February, and a 9-month low of 57.3 in April. Construction spending was much weaker than expected in October falling 0.1%, with downward revisions to prior months. U.S. factory data tracked estimates with 0.3% October non-durable increases for shipments and orders after a September trimming to 0.5% from 0.6%. A flat Michigan sentiment reading at the same 97.5 seen in November left the index still between the 14-year high of 101.4 in March and the 7-month low of 96.2 in August. 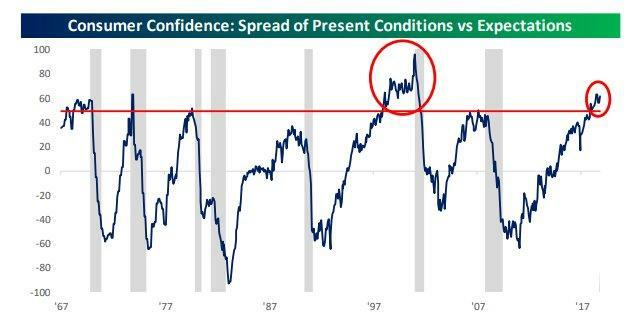 Sentiment towards the present is increasing, and feelings about the future in decline, the spread between the two indices remains at extremely high levels. In prior periods when this spread topped 50, it quickly reversed and a recession wasn’t far behind. The only exception was in the late 1990s/early 2000s where the spread reached stratospheric levels before finally reversing. When this spread starts to reverse in the future, it will be a signal that a recession is likely on the horizon, especially if it is accompanied by a turn lower in the Jobs Plentiful index. Friday’s headline jobs number missed the mark, and the trend of job creation reported by the BLS is definitely slowing. It’s important to emphasize that slowing job growth does not mean this report was weak. The wage growth story has continued to gather steam, with wage growth for non-managerial positions hitting new cycle highs and another solid month for total private wages. Slower jobs growth combined with higher wage growth is not a sign of a weakening economy. Caixin China General Manufacturing PMI output remains stable in November. The headline seasonally-adjusted Purchasing Managers’ Index, a composite indicator designed to provide a single-figure snapshot of operating conditions in the manufacturing economy, was little changed from October’s reading of 50.1 at 50.2 in November. This signaled a further fractional improvement in the health of China’s manufacturing sector. The Caixin China Composite PMI data (which covers both manufacturing and services) pointed to a stronger rise in total business activity across China in November. Notably, the Composite Output Index rose from a 28-month low of 50.5 in October to 51.9 in November to signal a modest rate of expansion. Rising from 53.0 in October to 54.5 in November, the seasonally-adjusted Nikkei India Composite PMI Output Index pointed to the fastest expansion in private sector activity since October 2016. Growth was stronger in manufacturing than in services, though quicker increases were noted across both sectors. The seasonally-adjusted Nikkei India Services Business Activity Index rose from 52.2 in October to 53.7 in November, signaling a solid upturn in output that was the strongest since July. Weaker service activity growth in tandem with a slower rise in manufacturing production resulted in the Nikkei Composite Output Index edging slightly lower to 52.4 in November from 52.5 in October. The slowdown in business activity growth was highlighted by a fall in the headline seasonally adjusted IHS Markit/CIPS UK Services PMI Business Activity Index to 50.4 in November. This was down from 52.2 in October and the lowest reading since July 2016. Monday, the EU’s top court released an advisory opinion indicating that Article 50 can be unilaterally revoked, giving the UK a potential emergency out if Parliament is unable to agree on the transition arrangement negotiated by Prime Minister May. On Tuesday, British House of Commons voted 311 to 293 to hold May’s government in contempt. Theresa May’s government will now have to turn over the legal advice to Parliament. It will then be looked over to make sure that it doesn’t contain any confidential information before being released to the public. Critics of Brexit suspect that these documents must contain predictions that Brexit will not go as well as May’s government has been predicting since they were not released immediately. Earnings Scorecard: For Q3 2018, with 99% of the companies in the S&P 500 reporting actual results for the quarter, 77% of S&P 500 companies have reported a positive EPS surprise and 62% have reported a positive sales surprise. Estimated earnings growth rate for the S&P 500 is 13.4%. If 13.4% is the actual growth rate for the quarter, it will mark the fifth straight quarter of double-digit earnings growth for the index. Valuation: The forward 12-month P/E ratio for the S&P 500 is 15.4. This P/E ratio is below the 5-year average (16.4) but above the 10-year average (14.6). For 2019, the bottom up EPS estimate, which reflects an aggregation of the median EPS estimates for all the companies in the index, is $176.51. If $176.51 is the final number for the year, it will mark a record high EPS result. The question that investors want an answer to, what is the likelihood that $176.51 will be the final EPS number 2019? Over the past 20 years (1998-2017), the average difference between the bottom up EPS estimate at the beginning of the year (December 31) and the final EPS number for that same year has been 8.3%. In other words, industry analysts on average have overestimated the final EPS number by 8.3% one year in advance. However, during that time period, there have been outliers like the 9/11 tragedy, and of course, the 2008/2009 financial crisis. If one applies the average overestimation of 8.3% to the current 2019 EPS estimate, the final value for 2019 would be $161.81. If we do exclude those outliers, the average overestimation would be about 3.5%. S&P 500 Earnings would then be in the range of $170. EPS of $170 would reflect a record high EPS for the S&P 500. Simple math using a conservative multiple of 17 yields an S&P value of 2,890, suggesting stocks are fairly valued today. No sooner than the U.S. delegation plane landed back here in the U.S., rumors, innuendos, tweets, etc. became the norm. People wanted details. Apparently they wanted to see how much every item on every grocery shelf in the country was going to increase by. It has always been common sense that when leaders of their respective countries sit down to talk on ANY topic, it is at the HIGHEST level of discussion. The details are left for later, as is the situation now. Hence the 90-day halt on more trade tariffs until the crux of a deal is forged. The stock market didn’t seem to like that at all. At the moment, common sense is not part of the equation. Market participants threw a tantrum taking down all of the indices this week. Believing that years of trade issues between China and the U.S. will be solved in a matter of weeks/months is simply not a reasonable approach. The entire trade tariff issue remains overblown. All of the media rhetoric is pure NOISE. Including the arrest of a Chinese national whose company may have been involved in bank fraud and possible violations of sanctions against Iran. Somehow that is being viewed as a negative to the ongoing trade negotiations. It is what it is, and nothing more. An incident that has come to fruition after a long investigation that more than likely started before there was a hint of trade tariffs being imposed. All of this fits PERFECTLY with a backdrop where every piece of news is extrapolated to the worst possible outcome, and we wonder how and why emotion plays a big part of the trading action. I have NOT HEARD ONE viable news story come out of any news agency on this topic since last week. Instead it is “this means that”, “they said this“, “apparently this means something“, “we don’t have details, so it has to be bad news“, and on and on. At times it is like listening to a room full of 5-year-old children, that can’t figure out when recess begins, and they start flailing their arms in frustration. The media is feeding into the fear factor with commentary that amounts to complete nonsense. NOTHING has changed on the trade front since the end of the G20 meeting. That is unless one is buying into the pundits hammering innuendo, their personal agendas, and rampant speculation. Did anyone actually think we were going to get what the new tariffs will be on each and every item, the day after the high level meeting? The current state of affairs on trading with China has been in effect for so long, it is NOT about to be figured out in days, weeks, or even months. Here is the bottom line, per the Office of the United States Trade Representative, tariffs will cost the average American family $127 per year. Now that can be construed as an agenda as well. I suppose we are somewhere between that and the average American eating eat cat food to survive because of the tariffs being imposed. It’s time for a reality check. Investors eagerly await the arrival of the adults entering the room to apply some common sense to the situation. The yield curve has flattened, the yield curve has flattened!! The article in the link is a little dated (December 2017) and makes my point that it isn’t necessary to overreact just yet. However, they are words that start many conversations about the state of the financial markets these days. Wait a minute, I thought the most common sense way to measure a true yield curve inversion was to measure the difference between the 2-year and 10-year yields. That difference now is 12 basis points. That is called a flat yield curve. A flat yield curve does NOT mean lower stock prices. There were many instances during the secular bull market in the 1990s where stocks rose with a flat curve backdrop. However, today it has been deemed that we all MUST look at the difference between the 2- and the 5-year or the 3- and 5-year Treasury yields primarily because they have indeed inverted and easily makes the Bear case. Prescribing to the 3-year versus 5-year spread as a reason to be concerned is walking out on a ledge. If one wants to use that as their holy grail, be my guest. There have been 73 unique instances of inversion of those two data points in the past 64 years and only 9 recessions. A yield curve inversion (short rates above long rates) has foreshadowed a recession with near flawless predictive abilities for the past 50 years. Historically, it’s taken about a year to go from current levels to an inverted curve, with the market rallying in the interim on every occasion. Recent history suggests that the greatest risk of recession occurs if the Fed continues to tighten after the initial inversion of the yield curve, which happened prior to the last two recessions. The Fed’s rapid policy reversal in 1995 prevented the tightening cycle from evolving into a recession. What economists will now debate is how much tightening remains before the Fed inverts the yield curve. Please remember by definition the yield curve that is used to measure the possibility of recession has NOT inverted just yet. Over a year has gone by and we have come full circle, right back to this topic. Every pundit wants to be the person that sniffs out the exact time to be out of stocks, the hero, the genius. Of course, they look at the yield curve and say that will be their signal. But staying invested has actually proven to be the more rewarding approach. Historically, in the year before yield curve inverts, global stocks have always posted gains and those gains have almost always been in the double digits. An inverted yield curve is not a sell signal. 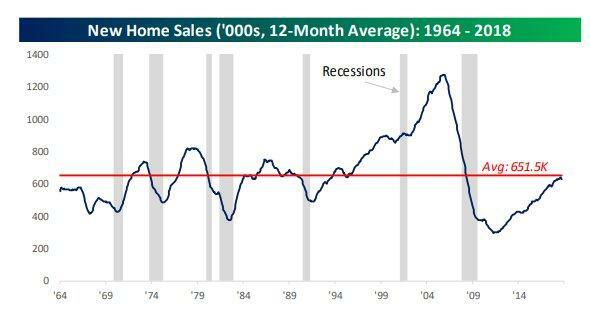 Recessions aren’t automatically around the corner. And it takes a while for them to arrive after the inversion, during which time stocks often rally. Moreover, the spread between the federal funds rate and 2-year Treasury yields remains close to 50 basis points, not flat, but rather accommodative. Individual investor’s outlook on markets from the AAII survey actually saw a bump in bullish sentiment this week. Bullish sentiment rose for the second week in a row to 37.94% from last week’s 33.88%. This is off of one of the lowest readings of the year from only a few weeks ago. Crude oil’s decline over the last 40 trading days has been nothing short of extraordinary. 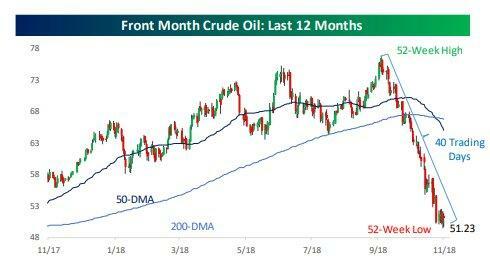 In the span of just 40 trading days, WTI traded at a multi-year high and then proceeded to lose more than a third of its value in what can only be described as a relentless decline. The EIA weekly inventory report showed the first decline in inventories in 10 weeks. U.S. commercial crude oil inventories (excluding those in the Strategic Petroleum Reserve) decreased by 7.3 million barrels from the previous week. At 443.2 million barrels, U.S. crude oil inventories are about 6%, above the five-year average for this time of year. Total motor gasoline inventories increased by 1.7 million barrels last week and are about 4% above the five-year average for this time of year. Crude oil dropped initially, then rebounded as OPEC met this past week and decided to cut production. WTI closed the week at $52.64, up $2.00. Traders and investors will continue to look at the $50 level as support. The week started off in rally mode, then ran into the resistance we spoke about last week, the 2,750-2,760 level. The rally off the lows (6% in 6 trading days) had left the index slightly overbought in the short run. Half of that rally was corrected in one day with a 90-point drop in the S&P on Tuesday, and most of what was left of that rally wiped out as the week went on. One positive, the sell-off stopped just above the late November lows. The trading range for the S&P that has been with us since the beginning of the year remains in place, but the index is back to testing the lower end of that range. It feels ugly BUT nothing has changed for the short to intermediate view as far as support or resistance. 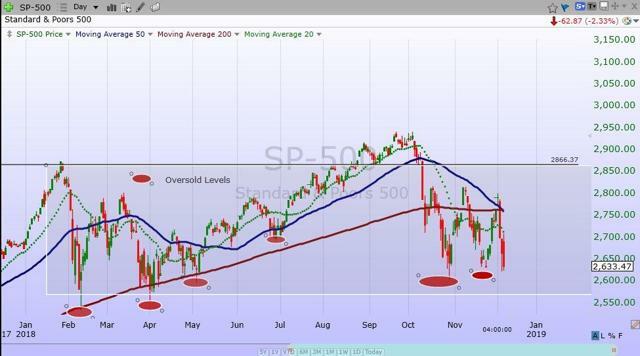 S&P 2,815 is the level to watch on the upside. A decisive break and close above that level portends good things can follow for the Bulls. The lower support area that is a key remains at S&P 2,603. The back and forth trading will continue. 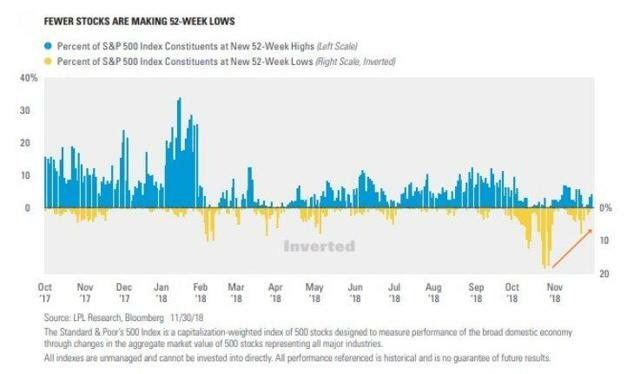 Investor sentiment is at lows, there is little to no direction in any sector as many are paralyzed by trade discussions, and the over-hyped incorrect talk of an inverted yield curve. We wait and see, never jumping to conclusions, BUT if the lows that we just saw this past week hold, then I will be leaning to having more conviction on the BUY side. A break below support and we reassess. Stay tuned. I look around and I hear that the semiconductor cycle is over and of course that is a precursor to a slowing economy, then recession. I do wonder then how do we explain the comments that we are hearing from some executives in the industry. For sure, there are pockets of weakness here, but there are also pockets of strength. Consider the recent earning report this week from Broadcom (AVGO). A beat on both the top and bottom line, a 50% dividend increase, and a $6 billion share repurchase program. Forward yield on the stock is now 4.6%. Hardly an outlook that presents an industry in decline. Please allow me to add. Intel (INTC) the 800-pound gorilla in the room has beat earnings estimates and raised its forward guidance for THREE straight quarters. A weakening economy, the semiconductor cycle is dead? I scratch my head. How quickly markets can change these days. Last week, I wrote about a positive tone that started to emerge; this week it is anything but a positive tone in the markets. The rally off the lows has for the most part been taken back. Volatility in times of uncertainty. Now it all depends on how much uncertainty is real and how much is being conjured up. The investors that arrive at the correct answer to that question will wind up reaping rewards in the near term. With the S&P now 10% from record highs, many will argue that it is time to pull out, and not be an owner of equities. I’m being told there are issues out there that I may be ignoring. Pundits are still calling to ramp up the downside protection. For sure there are “some issues” for an investor to monitor, and then there is the bushel basket of concerns that are simply NOISE. Of course, investors can extrapolate these issues and the technical picture to become a major concern. If an investor decides to base an investment decision based on a “feeling,” they may be in for a rude awakening. One situation that is very real and has been discussed here for months now is the weakening of global economic data. Before we jump to a conclusion, the period of 2015/2016 was mired in troublesome data. We survived that time period without an “official” bear market. The outcome this time around is still up in the air. One thing we are well aware of, we will need to see the global picture improve if we can expect higher stock prices here in the U.S.
With all of the negativity around, investors need to stay grounded. There are positives and they should also be acknowledged. The Fed is not acting in a hostile manner. Everyone is looking over their shoulder. There is NO euphoria. Earnings growth will slow BUT earnings are still growing. Consumers represent 70% of the economy and they are in good financial shape. Unless this time is different, these are not signs that appear at the END of a BULL market. At the end of any bull market, the primary trend will flatten then roll over. The evidence for that is quite obvious in the 2000 and 2008 time periods. No such evidence exists today. A successful investor will monitor, then react, not react then monitor. A moment to reflect the passing of our 41st president, George H.W. Bush. I would also like to take a moment and remind all of the readers of an important issue. In these types of forums, readers bring a host of situations and variables to the table when visiting these articles. Therefore, it is impossible to pinpoint what may be right for each situation. Please keep that in mind when forming your investment strategy. to all of the readers that contribute to this forum to make these articles a better experience for everyone. My portfolios are ALL positioned to take advantage of the bull market with NO hedges in place. This article contains my views of the equity market, it reflects the strategy and positioning that is comfortable for me. Of course, it is not suited for everyone, as there are far too many variables. Hopefully it sparks ideas, adds some common sense to the intricate investing process, and makes investors feel more calm, putting them in control. The opinions rendered here, are just that – opinions – and along with positions can change at any time. As always I encourage readers to use common sense when it comes to managing any ideas that I decide to share with the community. Nowhere is it implied that any stock should be bought and put away until you die. Periodic reviews are mandatory to adjust to changes in the macro backdrop that will take place over time. There is a reason for those excellent reviews. The Savvy Investor Marketplace service offers the keys to investment success. The current market is trading on innuendo, and rampant speculation causing a great deal of fear and uncertainty. Learn to use the FEAR of others to your advantage. The stock market will fool most of the people most of the time. It is time to get in on the right side of the trade. Please consider joining one of the most successful new ventures here on Seeking Alpha. Disclosure: I am/we are long ALL STOCKS MENTIUONED IN THSI ARTICLE, IN ADDITON I AM LONG STOCKS THAT ARE MONITORED IN MY SAVVY INVESTOR PORTFOLIO.